Cody is a senior at Lock Haven University working towards a B.S. in Biology with a concentration in Marine Biology and Environmental Ecology. 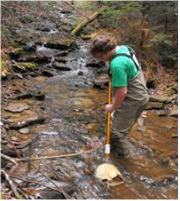 His internship work includes the assessment of benthic macroinvertebrates above and below AMD polluted tributaries along the headwaters of Twomile Run in the Kettle Creek watershed. Cody's internship is sponsored by Trout Unlimited. Zack is a junior at Lycoming College pursuing a degree in Ecology with a minor in Environmental Science. 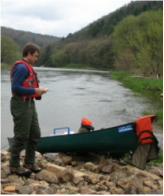 His work as an intern focuses on a benchmark monitoring study for the Susquehanna River and analyzing benthic macroinvertebrate samples collected from tributaries near the headwaters of the Susquehanna River. His internship is sponsored by Trout Unlimited. Aaron Furgiuele has a B.S. in environmental systems engineering from Penn State University. He spent six months as an intern for the Michael Baker Corporation doing traffic congestion studies. Beginning in January 2008, Aaron spent a year working as an assistant to the Clearfield County Conservation District watershed specialist through the federal AmeriCorp VISTA program. He is an active volunteer for watershed groups in Clearfield County, including the Deer Creek Watershed Association, the Moshannon Creek Watershed Coalition and the Anderson Creek Watershed Association. His interests include aquatic chemistry, hydrology, stream ecology and coal mine remediation. Aaron’s internship is sponsored by Trout Unlimited. Lori is pursuing a B.S. in Biology with a track in Ecology. Her internship work included analysis of benthic macroinvertebrate samples collected for the Old Town Sportsman Association and sampling for the West Branch Recovery Benchmark Project. Lori’s internship is sponsored by Trout Unlimited.